Learn easy steps to burn MP4 to DVD, convert MP4 to DVD in a few clicks with clean freeware on PC running Windows 10, 8 etc. From Vista to Windows 7, Miscrosoft delivered all Windows users an useful DVD authoring utility to free creat DVDs from MP4, AVI or some other video formats. But this utility, Windows DVD Maker, was removed from operation systems since Windows 8. That's to say if you'd like to burn MP4 to DVD on Windows 10, 8.1 and 8, you have to seek help from a third-party DVD maker. And questions about how to convert MP4 to DVD surely boom up like the following Q&A. Q1: I have many MP4 videos. How can I make DVDs with those MP4 videos? Is there any simple and fast way? I want excellent quality DVDs. Of course freeaware is the best. Q2: Hey all, Windows 7 had a built in DVD maker that was very helpful in burning video (.mp4) files to DVD, but the program is not supported in Windows 10. DVD burned from the media player app cannot be played on normal DVD players. So do I need software that can properly burn video files to disk? If so, any recommendation here? Either shooting or collecting interesting videos is a great joy. However, it may also become a big headache when those videos occupy lots of space on your hard disk. What should you do with the large video data? Uploading to cloud service online? Or compress bigger video into smaller one? Don't forget another safer way with no quality loss - converting video to DVD with a professional MP4 to DVD converter. So in the next part, this article will specifically explain how to convert MP4 to DVD on Windows (8/10) step by step. How to Convert MP4 to DVD on Windows PC? It can help you convert and burn any MP4(s) to DVD disc, VOB file and DVD folder easily on Windows 10, 8(.1) etc., be it 32 or 64 bit. You're also empowered to personalize DVD with chapter menu & subtitle, add music/picture as the background. How to Convert MP4 to DVD on Windows 10/8 or Lower? To play MP4 seamlessly on TV via DVD player, you should convert MP4 to blank DVD+/-R or DVD+/-RW. Please note that some DVD players have a hard time reading DVD-RW, and showing the error message like "Drive or Disk not ready". To fast and easily make DVD out of MP4 video, you need an excellent DVD creating tool. WinX DVD Author, the best free MP4 to DVD burner for Windows, is able to convert and burn almost all popular video files with high quality, including burning MP4 to DVD disc. Insert a blank DVD and run WinX DVD Author. 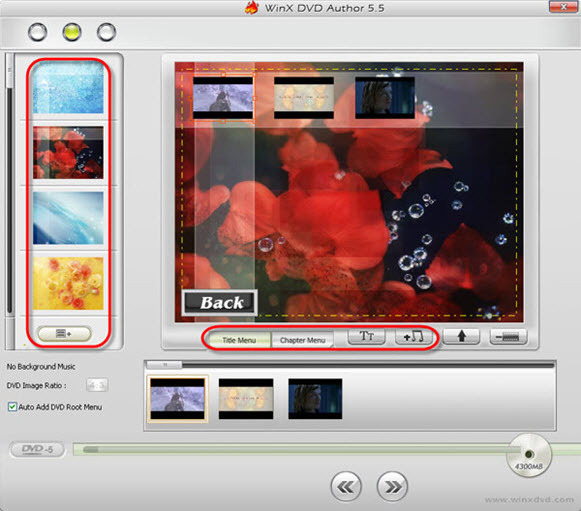 On the main interface, please click "Video DVD Author" button to enter second step. Several other options are also given here to meet more of your needs. 1). Click Add Files (+) button to add MP4 videos into source list. You can add more than one MP4 video at one time if you need. 2). Right click the source clip and you can find the options to move up/down, delete source video, add subtitle file, etc in the list. 3). Then click to enter the next step. 1. You can choose background picture in the list or use your own picture to personalize your DVD background by clicking . 2. Create title menu: Double click "Title Menu" then you can change the picture of title menu. Click to add text for title menu then double click to edit. 3. Create chapter menu: Click "Chapter Menu" to create chapter menu for selected clip in preview area. Click to add text for chapter menu then double click text to edit it. 4. Add background music by clicking . 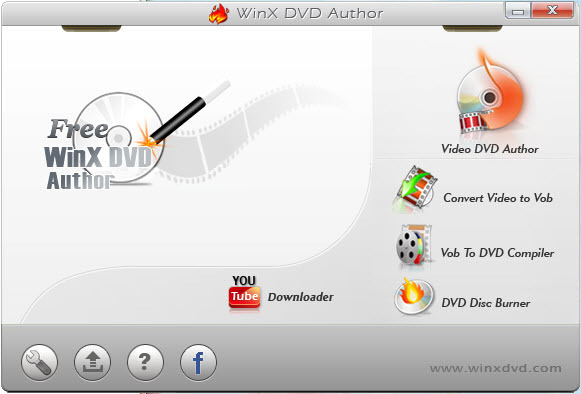 With only several simple steps, WinX DVD Author could help you burn and convert MP4 to DVD fast and easily. For converting DVD to MP4 in a more professional way, WinX DVD Ripper Platinum is the best choice, which is also capable of ripping DVD to AVI, MOV, FLV, iPhone, iPad, iPod, etc. It is fully compatible with Windows 10/8/7 and its Mac version runs well on macOS Mojave etc. Disclaimer: Digiarty Software does not advocate copying or ripping copy-protected DVDs for any commercial purpose and suggests referring to the DVD copyright laws in your countries before doing so. Download the best DVD creator freeware for Windows 10/8/7 to make DVDs from AVI, MP4, WMV, MKV, MPEG, VOB, MOV and more videos on Window (10). Download the best MP4 to DVD creator for Windows 10 and below, and learn how to create a DVD from MP4 video with menu. No watermark. Still tangled on how to burn a DVD on Windows 10/8/8.1/7? The best DVD burning software helps you easily 1:1 burn DVD to new DVD disc with original quality.